TheRustedChain - The Blog: It's not my time. Have you ever had a moment where God spoke to you so clearly it was like He was in the room with you? I have. It's overwhelming. Tear inducing. You know what you have been told and you know there's no way to unhear that. It's only happened a few times in my life and it's heart stopping. Other times, however, it's not as obvious. Sometimes it seems like God is completely silent, even though we desperately beg for answers. And still at other times, you know He's speaking, but it's a mumble. A jumble. You don't know exactly what's being said or what you're supposed to do about it. It's the Charlie Brown teacher. That's where I currently am. I hear messages coming at me loud and clear. Verses hit me squarely between the eyes. Sermons are clearly written just for me. But... what does it all mean??? 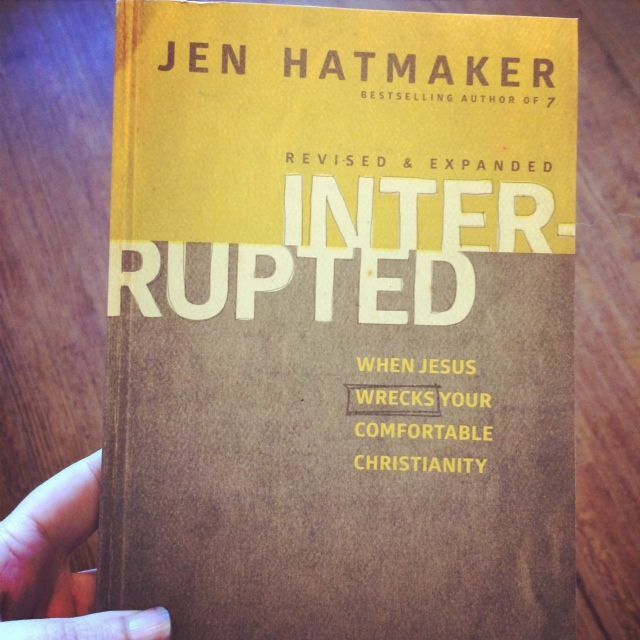 I was asked to be on the launch team for Jen Hatmaker's book Interrupted. And yes, it is wrecking me. (in real life my fingers aren't blue...) It's no coincidence I received this book when I did. How long have I been squeaky clean and comfortable? Sure, I will announce to anyone and everyone that I love Jesus but am I living it? Have I reflected God enough with my life? When was the last time I loved until it hurts? This book is not fluff. Don't get me wrong, I like happy clappy fluffy fun books. But this one is meaty. Thick. Deep. It's a lot to chew on. But it is oh so good. Here's a little secret: Jen Hatmaker is not all that special. (*gasp*!) She's actually pretty normal, just like you and I. But she's willing to dig deep, ask God tough questions, and hear even tougher answers. I'm scrambling to put all pieces of a puzzle together with a sense of urgency. I'm not even sure I have all the pieces yet, but I'm sure as heck willing to try to start creating something. I'm ready to start slapping them together hoping a picture emerges. I'll admit to being frustrated. And it's becoming apparent that it's just not my time. It's God's timing that matters. I want all the answers and I want them now. I want to understand these messages, weave them into a beautiful blanket, and begin using it, nice and cozy-like. But it's not time yet. If I were meant to understand, it would be clear by now. It's not my time. It's God's time. Next on my "to read" list. Looking forward to hearing how God "wrecks" your life. Praying the same in my own life. Love and Hugs!! I read the original and it was very powerful. Didn't know she was doing another version. Will have to add to my 'to read' list. This is where I am! There are pieces there and I kinda sorta partly understand. I kinda sorta partly know which way to go. But then again I don't. And all I keep thinking is not to run ahead of God. It will all unfold in His time and in His way. He gave me glimpses to give me hope, but I have to wait. Seems like there's a new book I need to check out! I honestly just discovered Jen Hatmaker about a week ago. I mean, I've heard of her, but hadn't read any of her stuff or done her studies. But I just completed Pulling The Thread, and was hooked. I'm excited to read the book, but nervous at the same time. God's been patient with me, but I know He's waiting for me to make the next move... Thanks!